Yes, I have ambition(s), but I never consider myself melancholy as I write letter to my future me 1 year later. I plan myself in a big blue print but still, I rarely write in a notes. Being a housewife instead never put out my ambition. Thanks Allah, though I feel early in my choosen path at least I have something to pursue indeed. Tonight, I watched last episode of Modern family, titled Crazy Train. In almost the end of episode, I found they mention about horseshoe turn (horseshoe curve) railroad in California. There are two horsehoe curve railroad in united states. One in California and the other in Pennsylvania (based on google). 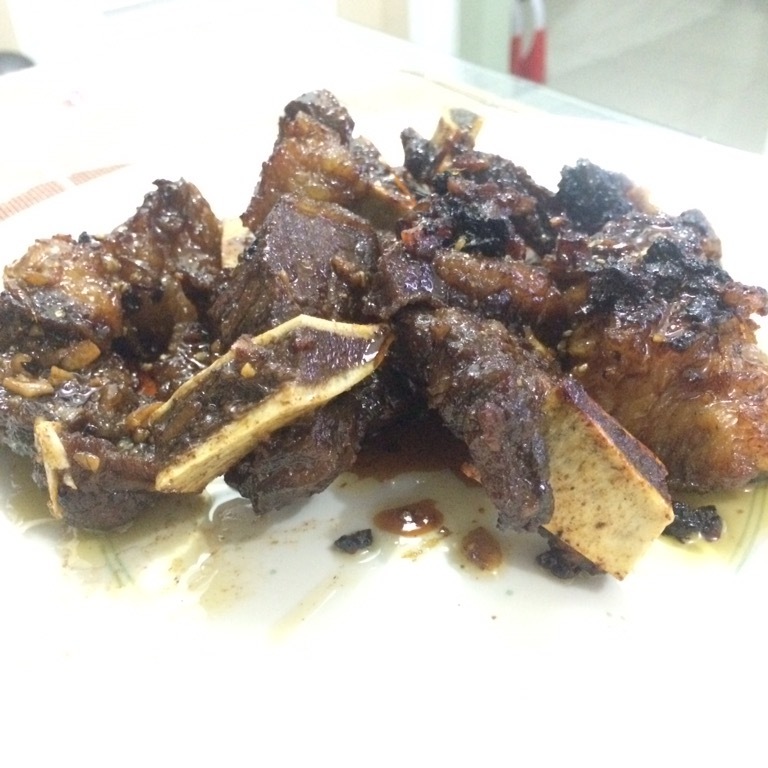 Bored of cooking soup, I decided to cook roasted ribs. Practically, I commonly cook soup if I have bone ingredient (ribs, oxtails,marrows). I googling the recipe and my final decision fall into lemon honey glazed roasted ribs. Oh wait, actually it is just honey glazed roasted ribs. Since my husband abruptly said “lemon honey”, it made me thought that it was absolutely good idea. Bechamel (white sauce) might known as the mother of sauce in western culinary. When you have ability to make really great bechamel, you just few steps from cooking western creamy dish. Have chicken soup? Add bechamel for chicken cream soup. Have macaroni? Add bechamel for mac ‘n cheese. Have lasagna? Add bechamel as sauce for lasagna bolognese. Have potato? Add bechamel for potato au gratin. Have steak? Add bechamel for complimentary sauce.Those just a a few of dish using bechamel. Today I randomly stumble to my Tumblr message. I instantly flashback my memory back then. My gaming life to be specific. And then I read this message archive. Tumblr is a social blog I rarely open nowadays though I still have the app in my iPhone. Blogging and re-posting in Tumblr synchronously a scarce habit for me. But due to I’m being in One Day One Post for 99 days challenge, sometimes I blog in tumblr to meet quotas. My tumblr posting is more personal because I am to afraid to show who personally I am in public. Only limited number know my tumblr account nowadays. Opening Tumblr is like a pandora and treasure box at the same time. You will find the posting you love. The posting you hate. Your posting is like a time machine and you are a time traveller. The memory will be reminisced. The story who has been fade away, appear in the surface waiting for you to dive into it. Sometimes you will just laugh so hard to your silly action and thought in your past day. Sometimes you find how different you are as a person in that day. People changes. Memory still remain. You notice how each one of your memory, good or bad has a remarkable place in your mind. Each story have their point of view and become a chapter to fill the page of your “life book”. There always something you can learn. And each of it always, always make you a better person through the day. Today, Hasan is 6.5 months old and I intended to enroll Hasan in baby swimming lesson. So I ended to scroll and browse swimming lesson information. I write post in ITBMh (ITB Motherhood ) Facebook Group. I summarized there are 2 reliable baby swimming lesson in Jakarta. One day, I randomly bought elbow macaroni in Supermarket and promised my Husband to serve Mac & Cheese for breakfast. Mac & Cheese apparently is super classic American breakfast menu. In my mind, I imagined Mac & Cheese is just combine Bechamel, cheese and Macaroni into one dish. Plus flavor (salt, pepper, nutmeg) and extras (bacon, minced beef) definitely. So I searched for another creation to enrich my mac & cheese. This recipe mostly I adopt from Ree Drummond’s recipe with many modification. Continue study abroad might be a dream by many of us. What’s your reason? What’s your purpose? What’s your goal? To elaborate the background of your dream perhaps need those kind of question. To strength your motivation. To encourage you. To reach your dream. What’s about mine?